The Sierra Club, a nationwide environmental organization, and three petitioners represented by Earthjustice, a non-profit law organization focused on environmental issues, have filed a lawsuit against the City of Oakland demanding it conduct an additional environmental review for the Oakland Bulk and Oversize Terminal. The new shipping terminal will be located at the old Army base in West Oakland may be used to ship coal through the city. The lawsuit, filed in Alameda County Superior Court aims “to hold the city to its duties to do more environmental review to the goal of informing the community of what will happen to their health,” said Irene Gutierrez, Earthjustice assistant attorney. The other petitioners represented by her group are the organizations Communities for a Better Environment, San Francisco Baykeeper and Asian Pacific Environmental Network. In 2002, an Environmental Impact Report was made for early redevelopment plans of the area, and an addendum was made in 2012 to assess changes in the initial redevelopment plan. The city entered a lease and development agreement with California Capital and Investment Group (CCIG) in 2012. The agreement leased parts of the Army base to CCIG for redevelopment. CCIG subleased to Terminal Logistics Solutions the rights to develop the Oakland Bulk and Oversize Terminal, which will transport bulk commodities from railroads to cargo ships. But Gutierrez said past environmental reviews of the redevelopment project did not take coal into account. On September 21, at a public hearing at Oakland City Hall, former Mayor Jean Quan said Phil Tagami, president of CCIG, never disclosed that coal would come through the facility. Environmental reviews were therefore affected by not taking this information into account, Quan said at the hearing. The lawsuit makes a similar claim: “In a December 2013 Oakland Global newsletter published by the developers, Phil Tagami expressly stated that ‘CCIG is publicly on record as having no interest or involvement in the pursuit of coal-related operations at the former Oakland Army Base.’” The lawsuit states that under the California Environmental Quality Act (CEQA), additional environmental impact reports are required if there are big enough changes to the original project. David Smith, partner at Stice and Block, which acts as legal counsel for CCIG, said via email that the developer is aware of the lawsuit, but at the time has no further comment on it. Alastair Iles, assistant professor of environmental science, policy, and management at UC Berkeley, said that if changes to the project have the potential to significantly affect the environment, an additional environmental review is required. “I would say that opponents have a good legal case to get the City of Oakland to order a new CEQA process,” Iles said. The conclusion of a new environmental review with coal taken into account would be different than previous ones, Iles said. A new review would raise questions about pollution along the coal’s route to Oakland and in the area surrounding of the terminal, as well as the effects on climate change that could be caused by the coal exported overseas being burned in power plants, he said. “CEQA can be a powerful tool for environmental planning, but so much depends on the willingness of Californian government agencies to enforce it properly and to take the resulting findings seriously,” Iles said. 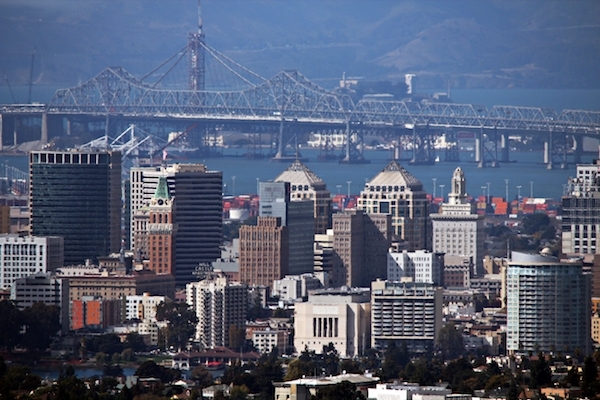 Alex Katz, chief of staff for the Oakland City Attorney’s Office, said the office cannot comment on pending lawsuits. Councilmember Dan Kalb (District 1) also he said he cannot comment on pending lawsuits. The Oakland City Council will give a status report on any new findings regarding the health and safety effects of coal on October 20 during the city council meeting. Councilmembers have until December 8 to decide if they will allow the transportation of coal. “If the city does the right thing and does the environmental review that we ask for, then obviously there would be no need for the lawsuit,” Lin said. Critics protest the export of coal at the public hearing at Oakland City Hall on September 21. Photo by Lucas Waldron.